The bold yellow paint I chose for this project is CeCe Caldwell’s Carolina Sun Yellow. It’s brash and in your face and I love it. 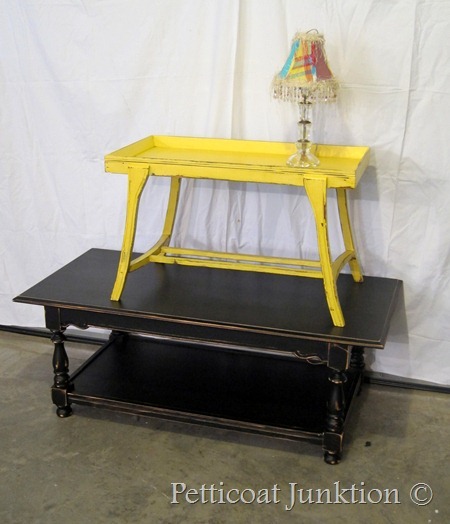 I painted one coffee table yellow and another coffee table Licorice (black). I didn’t tell a fib when I posted that I’m in my “painting and beautifying” phase. I painted on and off all weekend. That means I have another project to share with you. It really doesn’t take long to paint a piece of furniture. I have heard from readers that say they are scared to paint. Don’t be! If you paint the furniture and you don’t like it then paint over it. 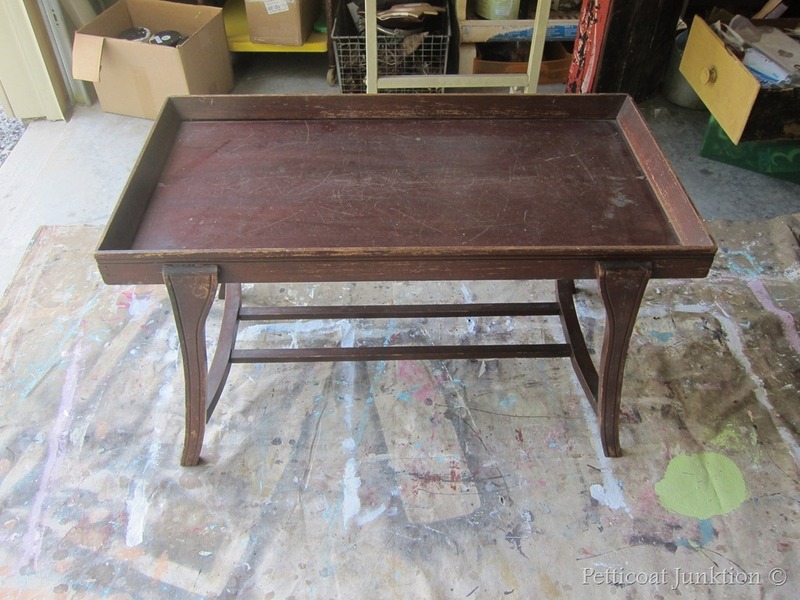 If you’re nervous start small……like a small end table…or just paint a board for practice! It makes me smile to look at these two tables! One is totally in your face and the other is a little more stately. Black is such a classy color but it also fits into any decor. This heavy solid wood coffee table had a place in my living room for years. My 8 year old granddaughter danced on it as a toddler. Her dad ( my son) couldn’t believe we would let her do such a thing. 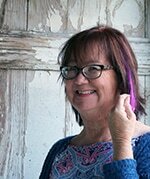 Hey, just because we didn’t let our kids do it doesn’t mean the grandkids can’t! If you’re a grandparent you know what I’m talking about. Or if you are parent of small kids……you know what I”m talking about. I bet your parents are the same! 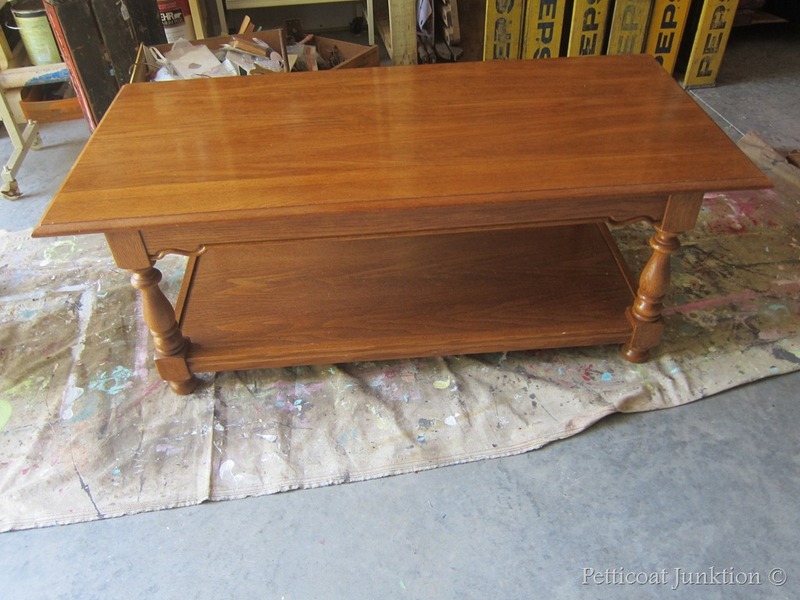 The table has been replaced by a cedar chest/coffee table that stores our second granddaughter’s toys. If second granddaughter wants to dance on that chest when she gets old enough, it will be perfectly all right with me. Anyway, It’s time to paint the table. And this cute little table came from My Favorite Junk Shop. 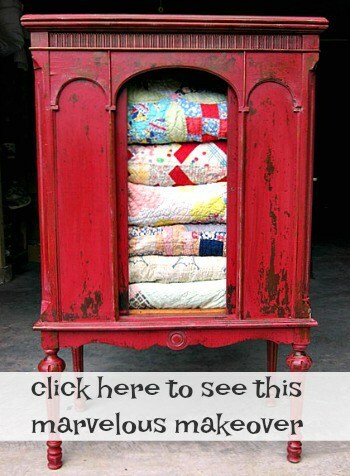 It’s different from my usual furniture finds. I like it. The legs are super cute and I like the overall small size of the table. It would be perfect for a small space like a sun room. 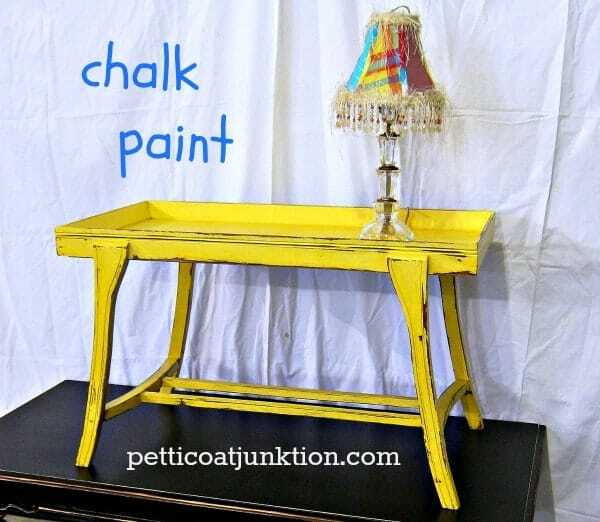 I chose CeCe Caldwell’s Chalk/Clay Paint in Carolina Sun Yellow for the little sassy table and Beyond Paint in Licorice for the more conventional table. The yellow paint went on so smoothly and covered in one coat. Can’t beat that. The Beyond paint is a primer, paint, and sealer all in one. I used two coats of the black paint just to make sure I covered the table well. I distressed both tables using my electric sander and 60 grit sandpaper. I distressed the table legs and all sharp edges and details. I used Minwax ployacrylic as a sealer on the CeCe Caldwell’s Chalk/Clay Paint. As I mentioned the Beyond paint is a primer, paint, and sealer all-in-one. No sealer necessary. The two colors contrast nicely, don’t they. 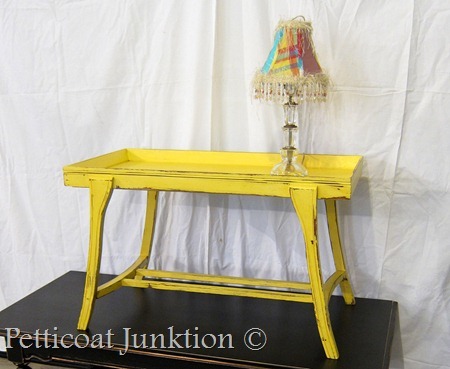 If you love the bold yellow of this piece I have another one for you. 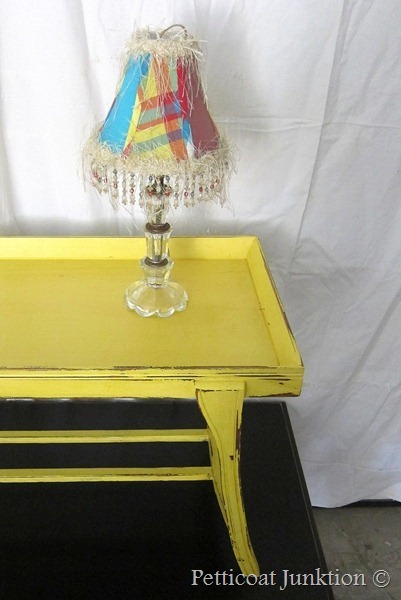 The chair is painted with latex paint (I love latex paint) and you can see it here…Bold Yellow Chair!